A CDB fleet is a collection of CDBs and hosted PDBs that you can manage as one logical CDB. A lead CDB is the central location for monitoring and managing the CDBs in the fleet. A CDB fleet provides the database infrastructure for scalability and centralized management of many CDBs. 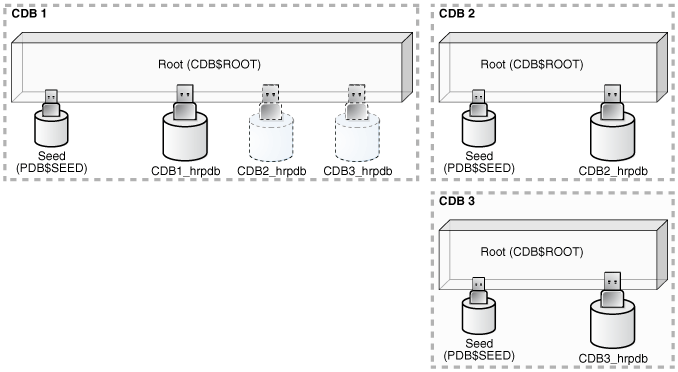 Set the lead CDB in a CDB fleet by setting the LEAD_CDB database property to true. Designate a fleet member by setting the LEAD_CDB_URI database property to a database link that points to the lead CDB. Designate one CDB in the fleet to be the lead CDB by setting its LEAD_CDB database property to TRUE. The other CDBs in the fleet point to the lead CDB by setting the LEAD_CDB_URI database property. After you configure the CDB fleet, PDB information from the various CDBs is synchronized with the lead CDB. All PDBs in the CDBs are now “visible” in the lead CDB, enabling you to access the PDBs in the fleet as a single, logical CDB from the lead CDB. The following figure shows a CDB fleet consisting of CDB1, CDB2, and CDB3. The lead CDB is CDB1. CDB2_hrpdb, which resides in CDB2, is visible in CDB1. CDB3_hrpdb, which resides in CDB3, is also visible in CDB1. Description of "Figure 14-1 CDB Fleet"
All Oracle Database features, such as Oracle Real Application Cluster (Oracle RAC), RMAN, point-in-time recovery, and flashback features, are supported for CDBs in the fleet. If a common application schema is configured with application containers, then these cross-container features enable query and data aggregation across PDBs in different CDBs managed in the fleet. Each PDB name must be unique across all CDBs in a CDB fleet. You can create a PDB in any CDB in the fleet, but you can only open a PDB in the CDB where it was created. The number of PDBs you must provision exceeds the MAX_PDBS initialization parameter setting, requiring you to create multiple CDBs. Different PDBs in a single configuration require different types of servers to function optimally. For example, some PDBs might process a large transaction load, while other PDBs are used mainly for monitoring, and you want the appropriate server resources for these PDBs, such as CPU, memory, I/O rate, and storage systems. Different PDBs that use the same application must reside in different locations. The lead CDB can run monitoring and reporting applications that execute across the CDBs in the fleet. You can install a monitoring application in one container, and then use CDB views and GV$ views to monitor and process diagnostic data for the entire CDB fleet. A cross-container query issued in the lead CDB can automatically execute in all PDBs across the CDB fleet. Using a common schema and common application objects in different application containers across the CDB fleet, you can use the CONTAINERS clause or a container map to run queries across all PDBs in the CDB fleet. To ensure a common application schema across the CDBs, the application can be installed in an application root. A typical use case involves installing the master application root in the lead CDB. An application root clone resides in every other CDB in the fleet. Proxy PDBs for the application root clones reside in the master application root. The lead CDB can serve as a central location where you can collect and view usage metrics and status of all or a subset of the PDBs provisioned in the CDB fleet. Microservices are a specialization of service-oriented architectures used to build flexible, independently deployable software systems. With microservices, each team can deploy and manage a CDB fleet with customized scaling and availability SLAs. The CDBs can use different storage systems and configuration settings and cater to different types of workloads. The lead CDB can help the central DBA manage the collection of CDBs associated with each individual microservice. In SQL*Plus, ensure that the current container is the root of the CDB that will be the lead CDB. Set the LEAD_CDB database property to TRUE. "About Container Access in a CDB"
You must use a database link with fixed user semantics, which means that the user name and password are in the link definition. The link cannot use connected user semantics, in which case the user name and password are not in the link definition. In SQL*Plus, ensure that the current container is the root of the CDB that you want to designate as a fleet member. If a database link does not exist, then create a link to the root of the lead CDB in the fleet. The database link must be a fixed common user database link. Set the LEAD_CDB_URI database property to the name of the database link to the lead CDB. This example assumes that the lead CDB is cdb1 and that the database link to the lead CDB does not exist. It also assumes that the network is configured so that the current CDB can connect to cdb1 using the lead_pod service name.